From 4 to 7 May 2015, Techtextil in Frankfurt will once again be throwing open its doors. The international trade fair for technical textiles and nonwovens will be showing all the relevant applications for these products – not only within the framework of industrial-manufacturing processes. If one looks at the possible applications of fabrics and films in architecture, then, besides classical facade and roof constructions, it is their use in connection with artificial or natural light in particular that is of increasing interest. 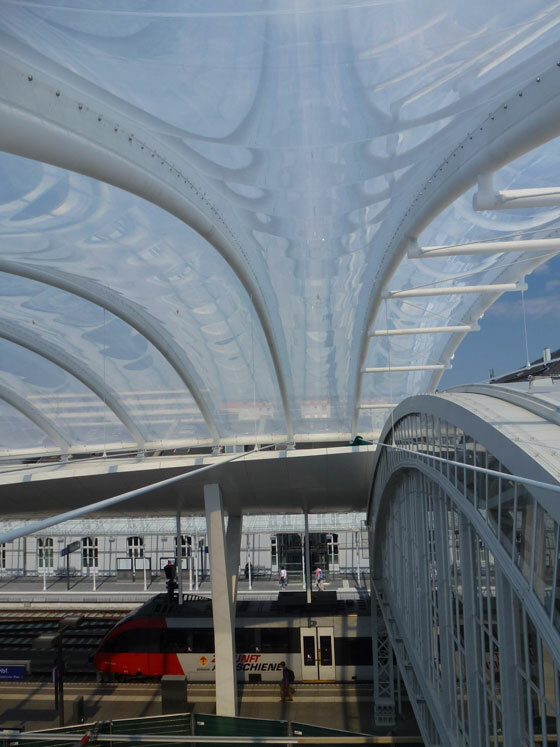 ETFE films have successfully established themselves as an alternative to glass, especially in outdoor areas, while indoors textiles from a variety of materials help to create different lighting moods. A few projects already document the wide range of uses of these products, whose respective modes of action architects take into careful consideration and which are implemented individually in close cooperation with manufacturers or processors. Textile solutions now make sense in not just very large projects. 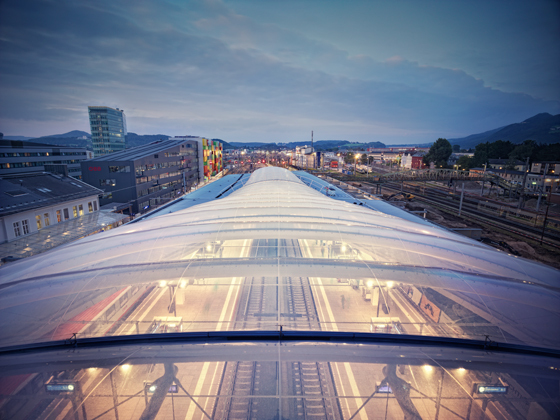 The platform canopy of Salzburg train station is an excellent example of the successful use – in terms of design – of ETFE films in the form of air-filled cushions. The design drawn up by architects from kadawittfeldarchitektur in Aachen draws its formal qualities quite substantially from the transparent roof structure. The implementation of the ambitious concept was in the hands of Sattler’s subsidiary Ceno Tec GmbH in Greven, Germany, whose services include not only the engineering, fabrication and installation of foil cushions, but also the pipe elbows of the steel structure, together with their supports and all necessary aluminium profiles. One particular challenge was the fan system, because the area in question in Salzburg was around 6,000 square metres in size, constructed in two phases and designed to withstand heavy snow loads. Needless to say, assembly took place during ongoing rail operations, and the millimetre-accurate fitting of steel arches was done very close to electrical cables. A total of 161 three-ply compressed-air elements of varying dimensions (2.6 to 3.metres wide by 13 to 24 metres long) were mounted in five roof strips with varying arch rise heights running in parallel to the platforms. The result is a bright-as-daylight canopy, whose visual lightness derives directly from its actual weight of less than 500 grammes per square metre of fluoropolymer film. Wet rooms are always something special from a construction point of view. 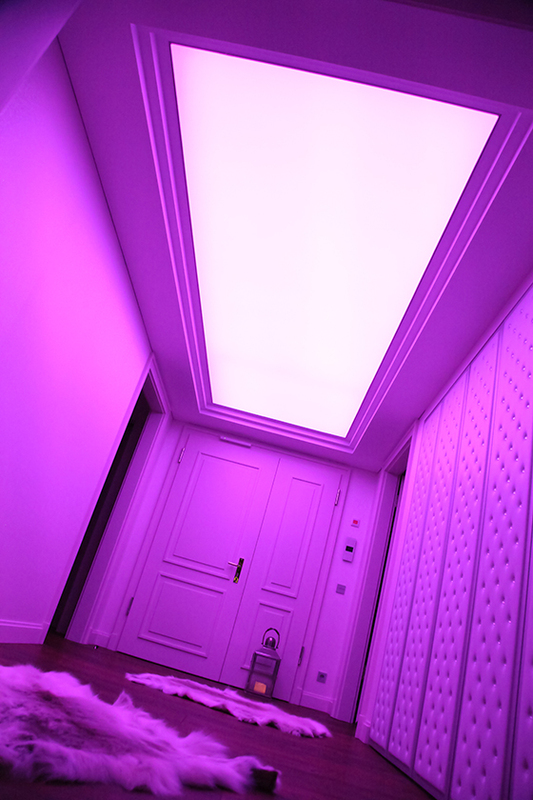 However, if they come equipped with a light installation on the ceiling and wall, as in the H2O Sports and Leisure Centre in Herford, then this calls for a very special solution. 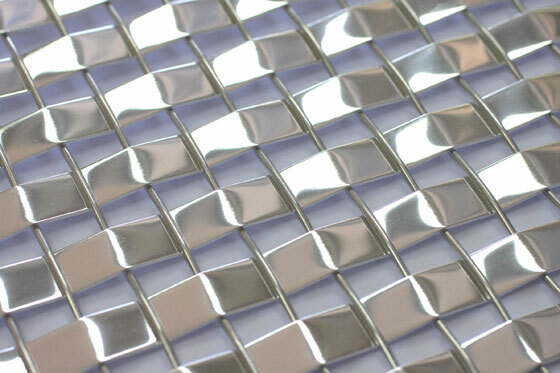 As a manufacturer of technical textiles, Ettlin Spinnerei und Weberei Produktions GmbH & Co. KG, based in Ettlingen, Germany, has brought to series production a light ceiling of glass, which when it interacts with LEDs creates impressive three-dimensional effects in various forms and colours. ETTLIN lux® Smart Glass is responsible for these effects. This is a laminated glass (safety glass) that embeds a special photometric fabric and interacts with rear-facing LEDs. With its Atlantic Glow reflective ceiling, technical weavers GKD – Gebr. Kufferath AG in Düren – allows architects and interior designers to reflect and deflect natural daylight and artificial light, thus enabling rooms to be illuminated in an energy-efficient way. 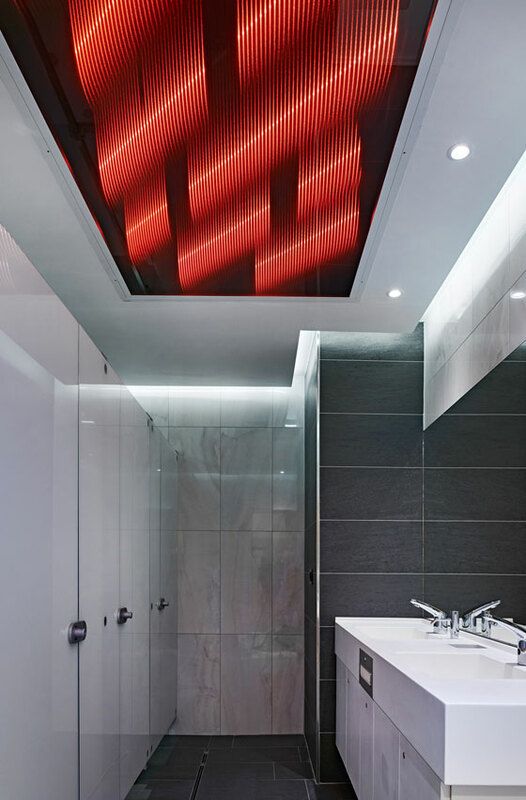 Unlike a white ceiling that scatters light diffusely, the high-gloss aluminium mesh enables targeted reflection in areas of the room outside the actual work zones, where, despite it being less bright, the difference in the levels of brightness should, at the same time, not be too big. Besides endowing the room with an elegant technical look, the mesh also lends it a certain exclusive ambience. Up to 95% of the light is reflected, which, in interaction with daylight, can have a direct positive impact on the electricity bill. In this context, the ease of care or the surface’s resistance to soiling is also evident. 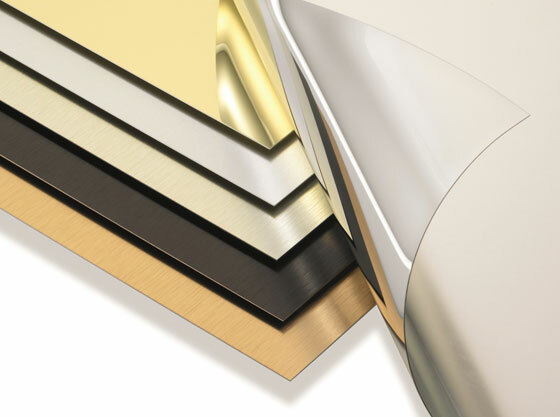 Anyone who is fearful of having so much aluminium silver on the ceiling or simply prefers a different colour temperature will be reassured to learn that Atlantic Glow comes in an anodised version – for example in champagne tones for more visual warmth and a cosy atmosphere but without any loss of overall reflectivity. If, at the same time, the acoustic optimisation of space is desired, the fabric is also available in composite form with honeycomb supporting plates and acoustic fleece. Whatever form is chosen, it is without doubt a sophisticated solution. ‘City in Motion’ was the theme of the 9th light-art festival GLOW in Eindhoven, Netherlands, last year. A fleeting and temporary affair, which nonetheless – or because of which – cast a spell on more than half a million visitors. 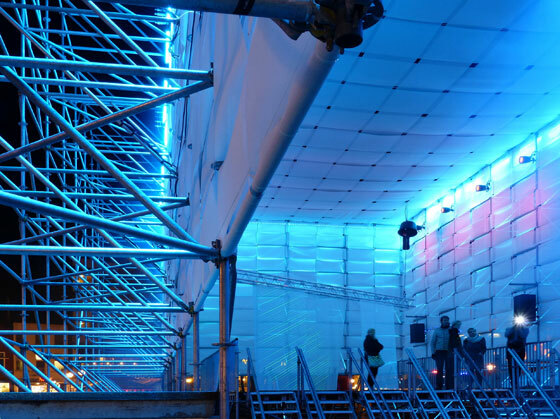 The highly acclaimed contribution of Ali Heshmati & Dr Lars Meeß-Ohlson – the interactive installation ‘Teatro del Mondo’ – was an almost archetypal space consisting of scaffolding bars and 1,400 square metres of Valmex® TF 400 fabric. 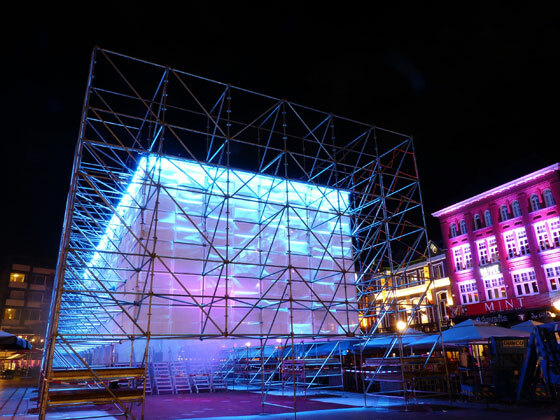 A fabric cube measuring 23 x 8 x 8 metres was woven into the roughly 27 x 12.5 x 10-metre-wide structure, with the vertical and horizontal strips of the open-mesh fabric at the same time hiding the structure, making the interior thus appear completely clean. The fabric, made by Mehler-Texnologies GmbH, is semi-transparent and was installed in Eindhoven in two layers with a roughly 10-centimetre gap. These were two important details in this application, because the viewer could thus only imagine the processes inside the cube from the outside and the textile surfaces also served as projection screens. The LED wall washers installed on the upper, outer contour modelled the cube as an object in the urban space, while LED spotlights shining from the top of the room inside, in harmony with the sound concept, rendered the concrete textile boundary a tangible experience. Textile and light harmonised perfectly in Eindhoven. The Pongs GmbH & Co. KG company from Stadtlohn, Germany, has evolved from a cotton-weaving mill into one of the world's most modern and efficient textile companies, currently offering around 12,000 product variants in widths of up to 650 centimetres. Textiles from Pongs are used around the world, primarily because of their visual impact, the manufacturer always remaining modestly in the background. There are spectacular applications in the context of modern digital printing for advertising space in the broadest sense and interior designs of a special kind, where architects and interior designers trust in the impressive combinations of smoothly spanning surfaces and spatial effects. The fact that theatres and opera houses around the world count among the firm’s regular customers is no wonder. When it comes to huge or at least very large areas, easy handling and the like, then textile solutions are a first choice. Internationally renowned architects are increasingly using textile surface design for large, prestigious spaces. Even when carrying out normal renovation work, textile systems with relatively simple assembly and clamping systems are superior to traditional construction techniques. A short shell construction time, little noise and dirt and a relatively small amount of time for the renovation of walls and ceilings favour the use of suitable textiles. The clever backlighting of stretch ceilings is only one aspect – albeit an important one – because with a DESCOR® ceiling, for example, a uniform and glare-free radiant ceiling surface that can also be printed on decoratively can be easily achieved.